The most used pressing movement nowadays seems to be the bench press, just look around in any commercial gym to verify this statement. Don’t get me wrong – the bench press is great for increasing pressing strength. However, a lot of people focus most of their attention on this movement, which sometimes can lead to overuse injuries, mainly in the shoulder area and/or the elbows. I’m not suggesting that you should drop the bench press altogether from your program – as I mentioned, it’s a great exercise for building pressing power – but it might be a good idea to at least cycle the pressing movements in your program. A direct benefit of overhead pressing is that the rotator cuff is strengthened, as it is activley working to stabilize the shoulder joint when the weight is over your head. But the start position for a military press – the bar resting on the shoulders – can be quite hard on the shoulder girdle, as it is in a very weak and awkward position. In a push press, you generate some upward momentum which helps the bar move, thus eliminating the need to press the bar of the shoulders, making the start of the movement somewhat easier on the shoulder girdle. Since push presses uses a dip and drive, you will be able to handle more weight in this exercise than in regular presses. Just holding a heavy weight overhead involves your whole body to stabilize the load, and the heavier the load, the harder it becomes. If you think that dipping and driving at the start takes away the strength building benefits, think again. Olympic lifters, which are some of the strongest athletes in the world – sometimes include exercises such as jerk supports, which essentially is a movement where you place yourself – in a partial squat position – under an elevated heavy bar and stand up with it. Depending on your limb length, the start position of a military press can be hard on the wrists. A lot of people end up holding the bar with their arms rather that resting it on the shoulders, which can be hard on both the wrists and the elbows – especially at heavier weights. One solution is widening your grip, but the downside of widening your grip is that your wrists can end up in a less than comfortable position. I think a better solution is push pressing instead. You may still have to widen your grip a bit, but the upward momentum makes it easier to quickly re-adjust your grip after the first part of the movement. The push press is more functional. Think about it – how would you go about lifting something heavy over your head in real life? My guess is that would use some momentum at the beginning of the movement, I know I would. It’s only natural to involve as much of your body as possible when trying to lift something heavy. Please note that I’m not saying that neither the bench press nor the military press are bad exercises; on the contrary, both these exercises offer a multitude of benefits if included intelligently in a strength training program. I’m simply saying that I believe that the push press, from a strength building perspectice, is an even better exercise – one that you definitely should consider including in your program. If you’re not familiar with the push press, I encourage you to at least try this great exercise. As always, start out relatively light and add weight gradually. We think that the push press is one of the best pressing exercises around. This is partly because many of the form issues for the military press – mainly the sometimes awkward starting position in relation to the wrists and forearms, depending on limb length and/or lack of sufficient flexibility – is not as much of an issue for the push press, since the movement is started with some upward momentum. The first issue – holding the bar with the arms – can be somewhat difficult to rectify, if this is the result of forearm length. Generally, the recommendation is to widen your grip, and this can work to some extent. A wider grip can make it easier to get your hands around the bar, instead of just resting the bar on your fingertips. A fingertips-only grip works fine when performing for example front squats, but when push pressing the bar needs a little more contact with the hands – otherwise, the transition from the momentum – the push – generated by the legs to the active involvement of the arms – the press – will be more difficult. The next issue – dipping down too shallow or too deep – is mainly a result of lack of practice. If you do the push press often enough, you will develop a feel for the necessary depth. Some people make the mistake of thinking that a deeper dip will generate more upward momentum, but that’s not the case. If you’re doing relatively heavy push presses, dipping too deep will actually make you lose speed and power on the way up; making the exercise look like a bad front squat. One cue I use when I teach the push press is “dip quickly and with power, between shallow and deep”. In most cases, this helps people find a pretty good depth right off the bat. But remember, practice makes perfect. 1. Fear of hitting your chin/nose with the bar. Yes, this happen sometimes, especially when people start out doing push presses. So people try to avoid it by increasing the distance between the face and the bar on the way up. The problem with this is that the angle of the bar path changes, resulting in an overhead position where the bar’s center of gravity is too far forward, making you either miss the lift or having to move around too much under the bar to regain balance and save the lift. This issue is addressed by tucking your chin back at the start of the movement, which helps both psychologically as well as actually by moving the chin a little bit out of the way. 2. Not understanding the proper overhead position. Since the bar starts in front of the head at the beginning of the lift, some people come to the conclusion that the bar should stay in front of the head at the end of the lift (when you hold the bar overhead on straight arms). Remember what I said about center of gravity? The proper overhead position is actually more to the back of the head. So – we tucked the chin at the start of the movement, remember? Well, as soon as the bar moves past your head, you stick your chin out again, moving your head and body in under the bar. 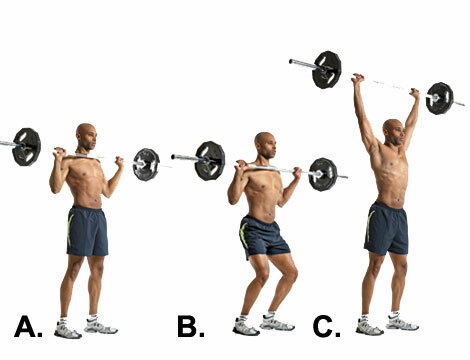 Look at the last picture in the sequence below for reference – the bar is more to the back of the head. 3. Failure to keep the torso – the upper body – vertical when dipping down. When dipping, the torso should be vertical to ensure maximum power and balance. If you lean too much forward or back, the power that is generated by the dip – the power that is supposed to be transferred to the bar – will be lost. So – keep the chest high, dip with the knees, and stay vertical throughout the movement. As you can see above, the first picture in the sequence shows optimal torso position (but elbows are too low because lack of weight). The other pictures shows what to avoid – leaning in either direction.